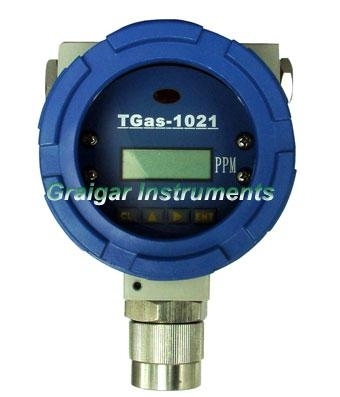 TGas-1021 Series Toxic and Harmful Gas Transmitter with two-wire system has embedded microprocessor, it can continuously measure the site gas concentration, and convert the concentration signal into 4~20mA output. It is extensively applied in petroleum, petrochemistry, chemical industry, gas, coal, metallurgy and electric power; safety detection in municipal administration, communication and traffic tunnel construction; electronics, semiconductor industry and other places with poisonous and harmful gases, etc. GB3836.4-2000 Electrical apparatus for explosive gas atmospheres--art 4 intrinsic safety "i"
Explosion-proof mark: ExiaIICT3, it applies to 0 zone, 1 zone and 2 zone, the place that contains IIA～IIC category and T1～T3 group of explosive gas mixture, and is qualified to get explosion-proof conformity certificate through inspection by CQST.